Some flooding remained in fields, such as this one on Garfield Avenue in Swanton, into Monday morning. Local farmers can expect average to below-average corn and soybeans yields this fall after Fulton County was deluged with above normal rain last month. Five days after a day-long rain June 27 dumped more than five inches of rain in the western half of the county alone, signs of flooding were still evident in all areas. Some crops remained underwater, and “ponding” in some fields had not abated. 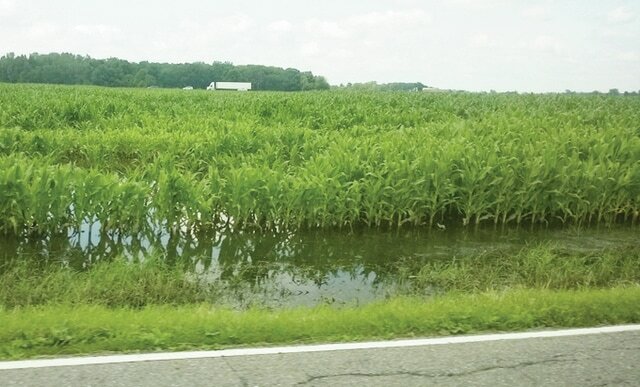 He said it’s possible the average farm in the western half of Fulton County conservatively lost three to five, and in some cases, 10 acres of crops to the 12 to 15 inches of rain the National Weather Service recorded locally between May 31 and June 3o. That is quadruple the amount of precipitation normally received during that period. “That translates into significant loss. I think we’re looking at an average to to slightly-below average crop,” Richer said. At a point where planting in some local areas isn’t complete, the county’s 80,000 acres of corn are expected to take a significant hit in yields. The equal amount of soybean acreage may fare even worse, since soybean plants typically can’t survive flooding. The county’s 10,000 acres of wheat, which are due for harvesting soon, were less affected by the rain than corn and soybeans. Nevertheless, wheat farmers will have to check for problems with quality, specifically head scab and other diseases the precipitation may have invited. “The humidity and moisture have been conducive to (those),” Richer said. The weather damage across northern sections of Ohio, Indiana, and Iowa, among other states, has caused a jump in new crop futures. Corn futures are currently in the low $4 range, and soybean futures in the low $10 range. Both are at a five to 10 percent increase. Fields need two weeks to dry off, then need to receive average rainfall for the rest of the season if corn and soybean farmers are going to produce an average crop, he said. This year, it has taken nearly $850 to turn out one acre of corn, and just under $6oo for one acre of soybeans, and to bring them to harvest. Farmers who took out crop insurance prior to planting have a choice of coverage, usually 60 to 85 percent. But Richer said farmers are aware that crop insurance levels are below the marketing value of this year’s crop. “Even though there’s crop insurance, they’re going to recoup some of the value but not as much as if we would have had (less ponding and) an average crop,” he said. Keith Truckor of Metamora is growing 650 acres of corn and 700 acres of soybeans this season. His crops got three to four inches of rain during the June 27 storm, and it took 2 1/2 days for ponding in his fields to clear, typical after a large rainfall. Because some ditches overflowed, some of his plants were underwater for a day. Still, only about five to 10 percent of his crops were damaged. “Some plants are starting to green up, but that’s a good indication to me that they survived the heavy rain. If the plant lives, it can be hurt but still produce,” Truckor said. At most, it’s a minor setback, he said. His crop insurance will cover the majority of expenses. Richer said the deluge of rain has taken a toll, and farmers probably can’t expect over-abundant corn and soybean yields. “But there’s a lot of summertime left. I think we can have an average crop for corn and soybeans but it depends on July and August,” he said.